The Donald Trump administration is seeking to step up sanctions and pressure as its key drivers to tackle North Korea’s nuclear and missile programs, while engaging the regime through diplomacy, top US officials said Wednesday. Following a two-month review, the administration is said to have recently settled on its North Korea policy, dubbed “maximum pressure and engagement.” Trump hosted a rare closed-door briefing for all 100 senators at the White House, after which Secretary of State Rex Tillerson, Secretary of Defense James Mattis and Director of National Intelligence Dan Coats issued a joint statement, vowing efforts to boost pressure on Pyongyang. “Past efforts have failed to halt North Korea’s unlawful weapons programs and nuclear and ballistic missile tests,” the statement reads. 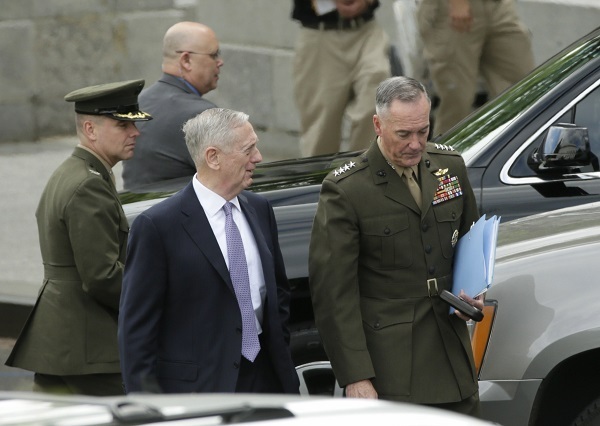 Calling the weapons programs an “urgent national security threat and top foreign policy priority,” the three officials called for the world to join its campaign, while sending the message the door is still open for talks. “We are engaging responsible members of the international community to increase pressure on (North Korea) in order to convince the regime to deescalate and return to the path of dialogue,” it said. The unprecedented statement is apparently designed to serve as the pinnacle of the Trump administration’s weekslong show of force and warnings against an additional major provocation. With speculation soaring over another nuclear test, Trump, Vice President Mike Pence and the secretaries have been sharply ratcheting up pressure against the Kim Jong-un regime. They forward deployed a nuclear-powered supercarrier and other cutting-edge military assets toward the peninsula, floated military action and warned the North “not to test” the US’ resolve, while pressing China to take a greater role in reining in its wayward neighbor. While carrying a more moderate tone relative to recent weeks’ shrill rhetoric, the statement lacks details that may point to a fresh strategy and tactics. The officials have repeatedly declared the demise of the “strategic patience” policy favored by previous President Barack Obama. But sanctions and pressure were the centerpiece of the approach, and dialogue has never been ruled out under any administration, observers say. After the briefing, some of the US senators also took issue with the absence of specifics on the Trump administration’s thinking on North Korea and any potential future actions such as in response to a new nuclear test. “Having dealt with the North Korean nuclear issues for more than 20 years, it’s extremely difficult for anyone to come up with an entirely new yet sound approach at this point,” an official at Seoul’s Foreign Ministry said on customary condition of anonymity. In another development, a White House official said the US is considering putting North Korea back on the State Department’s list of state sponsors of terrorism. The US House of Representatives approved a bill calling for the redesignation early this month, and similar legislation has also been introduced at the Senate. Washington blacklisted the communist state in 1988 following its midair bombing of a Korean Air passenger plane, killing all 115 aboard, but lifted it in 2008 as part of six-nation nuclear negotiations. Any return to the list would make Pyongyang subject to further sanctions on trade, investment, assistance, financial transactions and other engagement with the US. After the release of the joint statement, South Korea’s leading presidential candidates pledged to play a “proactive role” in resolving the nuclear standoff if they win the May 9 election. Front-runner Moon Jae-in of the Democratic Party of Korea expressed concerns that South Korea may be put on the back burner as the US and China dominate the discussions. Ahn Cheol-soo of the People’s Party, No. 2 in presidential polls, stressed the significance of the Trump administration’s attitude toward diplomacy, which he said would foster a “positive environment” for South Korea to resolve the stalemate. Seoul’s Foreign Ministry also issued a statement touting Washington’s efforts, saying the latest move showed its determination to change Pyongyang’s course and return to serious negotiations. “The joint statement reaffirms the US administration’s clear resolve to take the North to the path of denuclearization through economic and diplomatic pressure,” spokesperson Cho June-hyuck said at a regular news briefing Thursday.